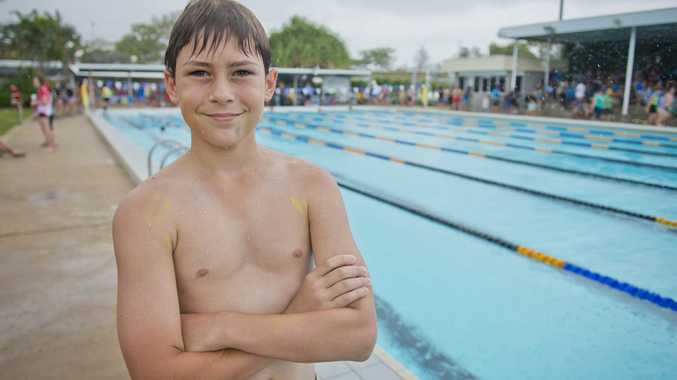 OCCASIONAL bursts of heavy rain did not dampen the spirits of 600 school students at the Toolooa State High School Swimming Carnival yesterday. And for Sean Hunt, it was a day of two special accomplishments in his first-ever competitive outing. The 11-year-old who represented school team Keppel clocked to record times in the breaststroke and freestyle with times of 53.08sec and 38.85sec respectively. Perhaps his times were because he received swimming classes as a baby. "I was above average," Sean recalled. "I had no idea that I had set a record and had butterflies in my stomach." The Meteors soccer player will now think about taking up swimming more seriously. Elliot house captain Nathan Spencer, 16, told the Observer that the competition was all about having a go and not about the abilities of swimmers. "It was real fun getting in the pool and all the young Year 7s had a red hot crack," Nathan said. His rival Brad Preston managed to have a friendly sledge at Nathan. "I actually beat Nathan in the butterfly, but I'm actually not that good at swimming," Brad said with a laugh. He added that his teammate Jesse Edwards led from the front. "She has been getting everyone involved and she's a good role model," Brad said. Heron captain Rachelle Eastway added all fun and festivities are put aside when it came to the races that were decisive. "During the finals it was serious between everyone," Rachelle said. Toolooa High School deputy principal Mark Thomas said the day was a success. "We had 600 students and the school hold 1000 so to have 600 is not too bad," Thomas said. "We value in the culture and spirit in events like these because everyone's participating."